West of Sligo, on the south side of the estuary, is the resort of Strandhill. On the shore to the north is the church of Killespugbrone (church of Bishop Bronus), named after a disciple of St. Patrick. A curious feature of this little ruin is that the round-headed doorway normally at the west end, is on the south side instead. Long-preserved here, and a place of pilgrimage in the 17th century, was the Shrine of St. Patrick’s Tooth, now in the National Museum, Dublin. The view of the surrounding mountains from the summit is extensive. On the southwest side is the Glen of Knocknarea, a chasm in the limestone bounded by steep cliffs. You can return to Sligo by a minor road passing Carrowmore Megalithic Cemetery, a low hill possessing the largest group of megalithic tombs in Ireland. There are over 60 partially complete passage and portal tombs, and many more have been destroyed by gravel quarrying; the oldest predate Newgrange by 700 years. Many are within easy reach of the road; there is a small on-site exhibition. To the south of Sligo is Ballysadare. It is sited on the Owenmore river, and noted for its salmon fisheries. On the river bank are the ruins of an abbey founded by St. Fechin (c 645)..
Further south is Collooney. Here in 1798 a skirmish between a detachment of Limerick militia and General Humbert’s troops ended in the retreat of the former to Sligo; a monument commemorates the gallantry of Humbert’s aide-de-campe. 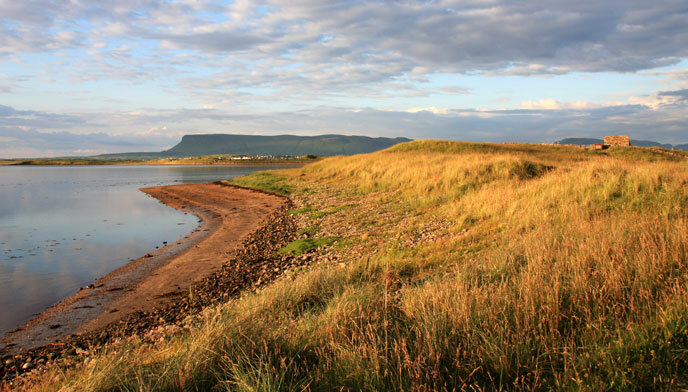 Knocknarea is a hidden gem which is worth a visit on your tours of Ireland.